Cut Type, Size: Cross Cut, 5/32" x 2"
The Fellowes AutoMax™ 130C Hands Free Paper Shredder is a powerful shredder that can shred 130 sheets automatically and it has an additional 8 sheet capacity that can be shredded manually. This paper shredder has a maximum run time of 10 minutes after which it requires a 25 minutes resting period. Creating cross cut particles of 5/32” x 2”, at security level P-3, the 130C shredder ensures user confidentiality. 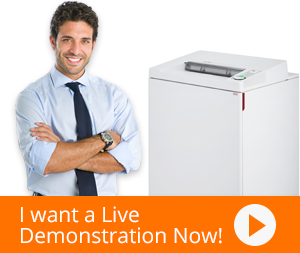 The AutoMax 130C is a hands-free paper shredder for convenient and productive shredding. The AccuFeed™ System provides fast automatic shredding. This shredder can shred other media like Staples, Paper Clips, and Credit Cards. Furthermore, the SilentShred feature ensures workplace silence during shredding processes, making it ideal for shared work spaces. Energy saving Sleep Mode feature shuts down the shredder after 2 minutes of inactivity. Built-in innovative touch screen technology with back-lit LEDs makes Fellowes AutoMax™ 130C Hands Free Paper Shredder the ultimate choice.